achieving peace, stability and long-term prosperity," following 16 years of conflict, U.S. authorities said. 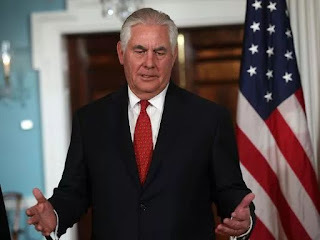 Tillerson also outlined the Trump administration’s new South Asia strategy, which "makes clear" the United States' commitment to working with the Afghan government, partners in the region and to "achieve peace in Afghanistan and deny safe haven to terrorists who threaten that goal," according to a statement from the U.S. Embassy in Kabul. The talks were centered on counterterrorism, Afghan broadcaster TOLOnews reported. The U.S. Embassy said Ghani "reiterated his support for the new U.S. strategy." Tillerson, who spent just over two hours in the Afghan capital, departed for Doha, Qatar, following the meetings, which were part of a week-long trip to the Middle East, South Asia and Europe that started in Saudi Arabia. He will visit Pakistan on Tuesday, before heading to India. President Trump outlined a revamped strategy for Afghanistan in August, with measures including more troops, lifting restrictions on commanders in the field imposed by the Obama administration, and increasing pressure on Pakistan to stop providing a safe haven to militant groups along its border.